AUG. 26-30, 2013 Kim Lawson Crest Middle School. 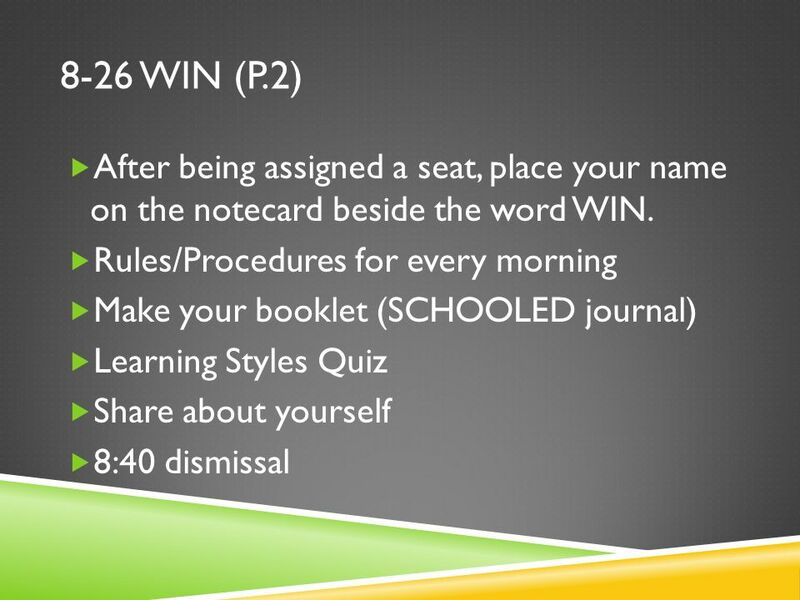 8-26 WIN (P.1) Please find a seat where there is a notecard. DO NOT WRITE ON IT! You will change seats. 2 8-26 WIN (P.1) Please find a seat where there is a notecard. DO NOT WRITE ON IT! You will change seats in a moment. On a blank sheet of paper, write your name, and 2 things about yourself (BIG TEXT) Take 10 sheets of paper out of your notebook and have a pencil ready. 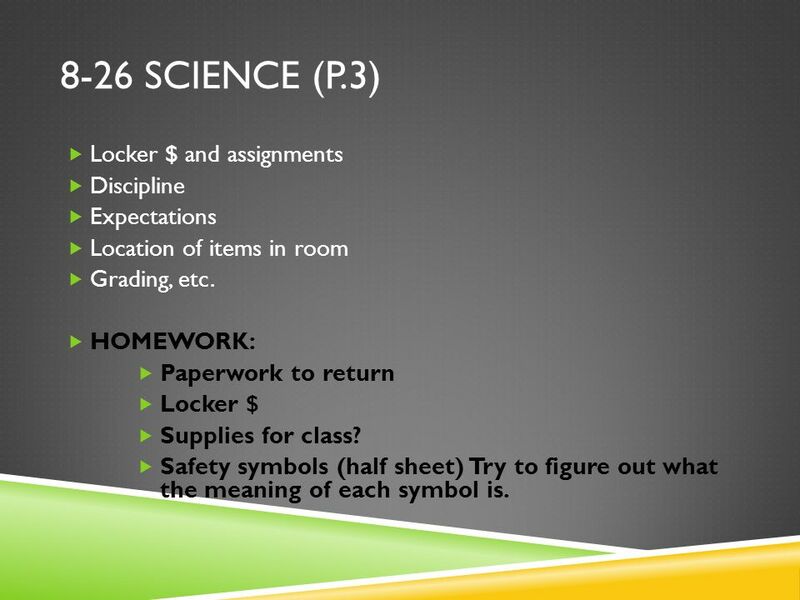 6 8-26 SCIENCE (P.3) Locker $ and assignments Discipline Expectations Location of items in room Grading, etc. HOMEWORK: Paperwork to return Locker $ Supplies for class? Safety symbols (half sheet) Try to figure out what the meaning of each symbol is. 7 8-27 WIN Come in quietly and find your assigned seats. 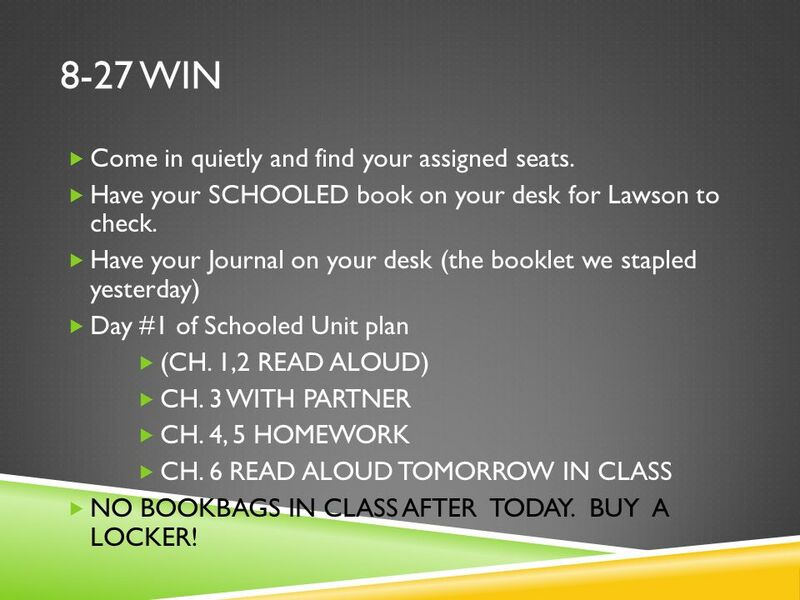 Have your SCHOOLED book on your desk for Lawson to check. Have your Journal on your desk (the booklet we stapled yesterday) Day #1 of Schooled Unit plan (CH. 1,2 READ ALOUD) CH. 3 WITH PARTNER CH. 4, 5 HOMEWORK CH. 6 READ ALOUD TOMORROW IN CLASS NO BOOKBAGS IN CLASS AFTER TODAY. BUY A LOCKER! 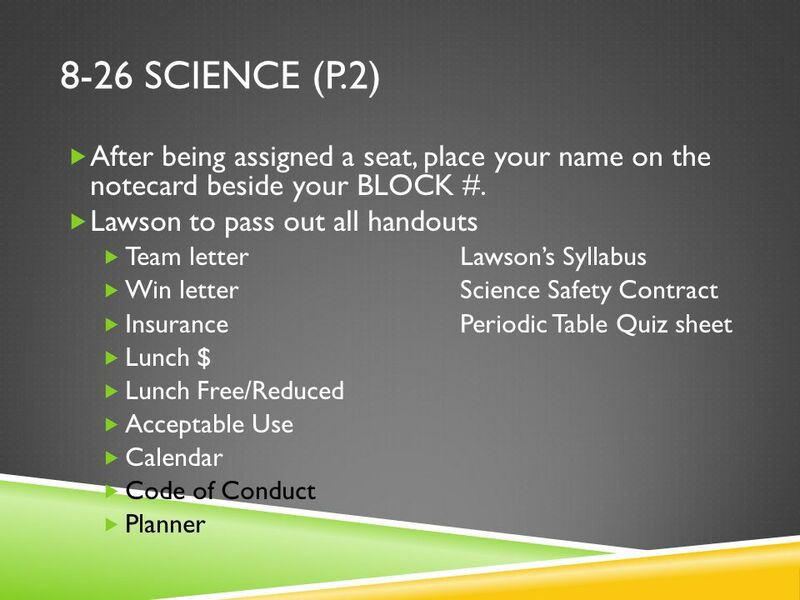 8 8-27 SCIENCE Find your assigned seat QUIETLY (4 th block!!!) DO NOT turn in signed papers until I ask for them. Todays starter: (Write question and answerlabel as #1; always be prepared to discuss) Why should this class/subject SCIENCE be important to you? 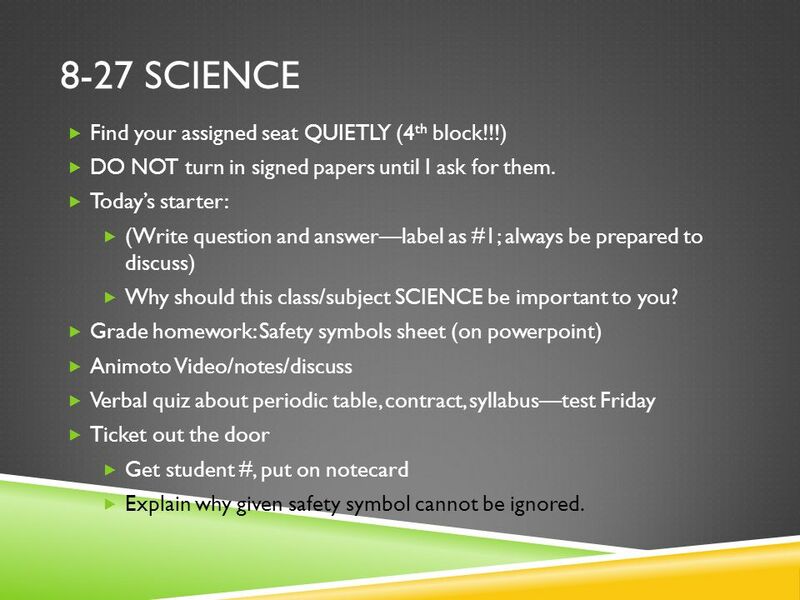 Grade homework: Safety symbols sheet (on powerpoint) Animoto Video/notes/discuss Verbal quiz about periodic table, contract, syllabustest Friday Ticket out the door Get student #, put on notecard Explain why given safety symbol cannot be ignored. 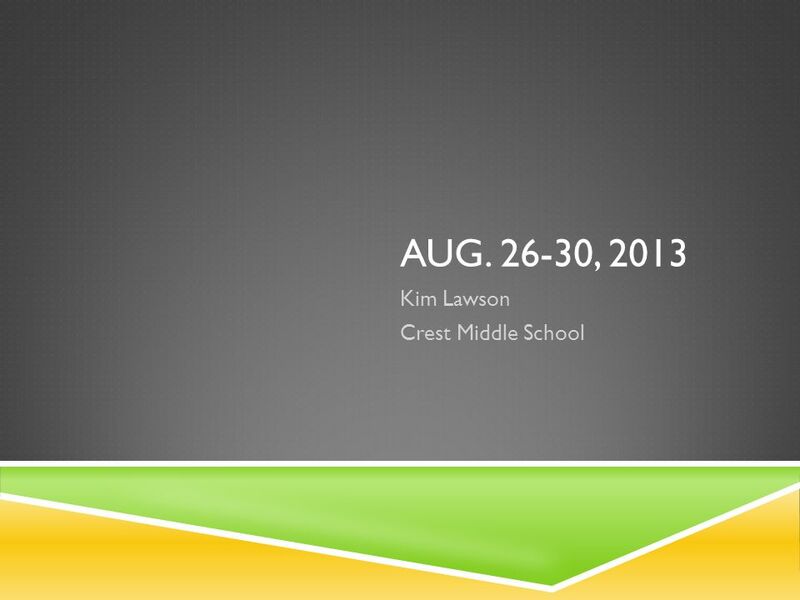 Download ppt "AUG. 26-30, 2013 Kim Lawson Crest Middle School. 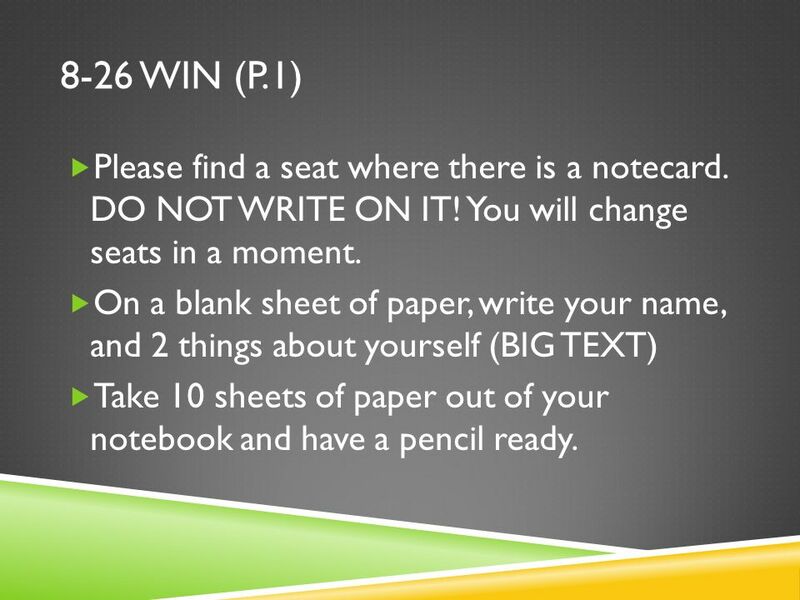 8-26 WIN (P.1) Please find a seat where there is a notecard. DO NOT WRITE ON IT! You will change seats." Welcome to AP Chemistry Mrs. Spoon Please have a seat and be ready to begin when the bell rings. Welcome to 7 th Grade School Year. Day 1 August 20, 2014. Welcome to CGMS Science Ms. Baker The Science Queen. Class Rules and procedures.  Fold a piece of paper in half, long way or hot dog fold If you don’t have paper check with a neighbor  Write your name. 8 TH GRADE SCIENCE MS. DIXIE ORR GO PATRIOTS!! MY address is: WELCOME ROBERT ANDERSON MIDDLE SCHOOL. HOMEROOM MS. LEMIRE. MY CONTACT INFORMATION Name: Ms. Lemire Room: A325 We will have about 6 homeroom meetings this year. August 14, 2013 Daily Goal: IWBAT explain the class room procedures HW: Bring Science Materials Dispatch: On a separate piece of paper, answer the following. Welcome to HMS. Information for Index Cards Full Name (First, Middle, Last) The name you would like to be called Parent or Guardian’s name Home address. 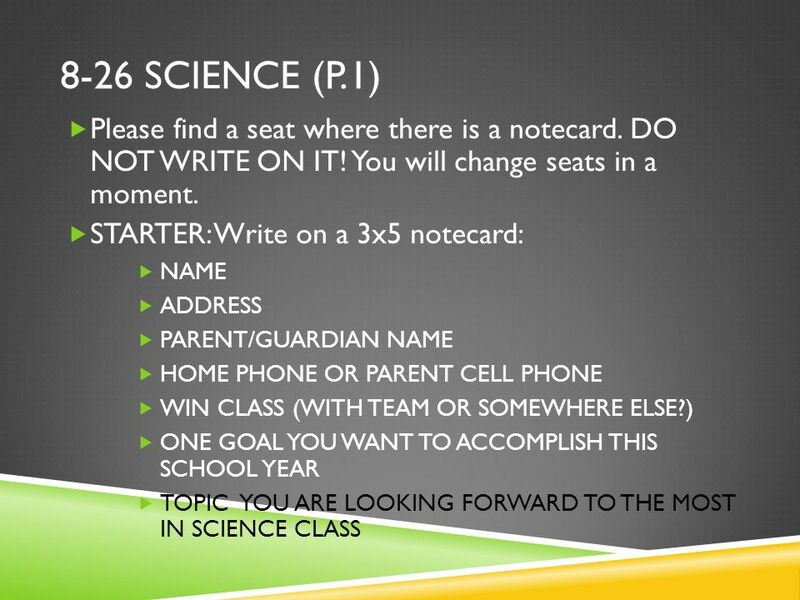 8/20/12 7 th Grade Science. 7A Warmup Brainstorm a list (at least 3) of science topics that you studied in 6 th grade and what you can remember most about. Class Rules and procedures.  Sit in your assigned seat and fill out your agenda:  1. Forms (bring filled out as soon as possible!)  2. Sign Science. Welcome to Long Beach Middle School 8 th Grade Science. 1 WELCOME! Get papers & an index card from the front table. 1 st Only: Copy your schedule into your notebook. Write the following on the index card: Name.